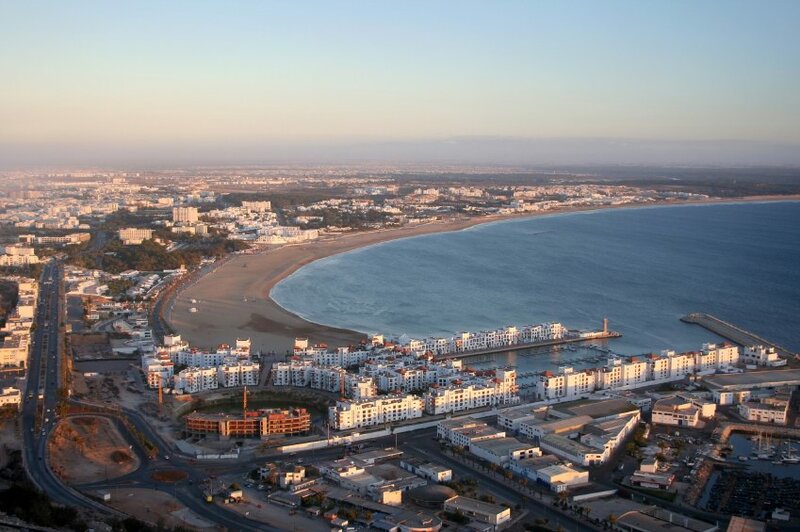 The southern resort of Agadir, 125 mi/200 km southwest of Marrakech, draws large numbers of sun-seeking tourists, but it lacks the traditional charm of other cities in Morocco. It was rebuilt and overdeveloped in the 1960s following a devastating earthquake. Go there for the warm winter weather, the sandy beach, resort hotels and its good tourist infrastructure—not for the architecture or a true sense of Morocco's heritage. Holiday package tours are a mainstay for resorts there, and low-cost or charter flights transport a large percentage of northern Europeans in their quest for a tan. Think of it as Morocco's version of Antalya, Turkey, or Malaga, Spain, given that most guests are European. Visit the 16th-century casbah on top of the hill (primarily for the view of the town and water) and the Municipal Museum, which has some nice displays of Berber jewelry. For a change of pace, rent a camel for a ride along the beach (head for the wild dunes on the southern part of the beach) or take part in an organized diffas, a Berber meal usually accompanied by a traditional dance performance. Day trips can be made to Tafraoute, Goulimime, the Sous Massa National Park (sightings of flamingos and other migratory birds) and Tiznit (a walled oasislike town—watch the jewelers at work).